Hello sci-fi fans and thank you for coming back to visit. When I was a kid, my dad bought an Atari gaming system. We spent hours upon hours playing “Centipede”, “Space Invaders” and “Pac Man”. Little did we know, that there was actually someone watching the games to see who would get the highest scores. 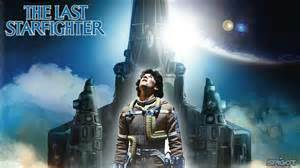 As is the story and case in the 1984 sci-fi flick “The Last Starfighter”. Teen Alex Rogan (Lance Guest), his mom and little brother live in a trailer park where everyone is like family. In his spare time, Alex is the handy man. 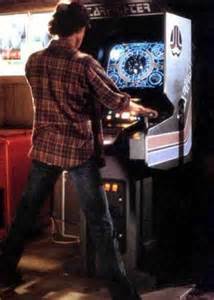 His only escape from the humdrum is his favorite past-time…a game called “Starfighter”. Alex would rather play the game than do his job or hang out with his girlfriend as he is so close to getting the newest high score. Of course, little does Alex know, this game is only a training and testing program created by the alien Centauri (Robert Preston) to recruit much-needed pilots and gunners for the war against the ever evil Xur and the Ko-Dan armada. Centauri shows up, takes Alex for a ride and sends the boy head first into a war more real than he could have imagined in his game time. Now you would think that Alex’s family and friends would notice that he’s missing. Nope, not at first, thanks to an android named Beta who is left in Alex’s place. All I will say about that is that Androids and girlfriends don’t mix. After seeing someone tortured by Xur, Alex is not down with the prestige of fighting in this war. He demands to be taken home, and Centauri obliges. Then, Xur attacks the base on Rylos, destroys all the Gunstars, save one, and does something really stupid. He sends an assassin to earth to kill Alex. Now if he’d just left well enough alone, Xur might’ve been able to win the war. But no, he gets stupid and that activates Alex’s self-and family preservation. This movie was directed by Gary Nelson, grossed $29.7 million and stars a very young Wil Wheaton, Heather Locklear, Dan O’Herlihy, and Catherine Mary Stewart as Alex’s girlfriend Maggie. I loved this movie because it gave me the hope that even when one dreams about getting out of a dead-end life, there is always something wonderful beyond the stars. 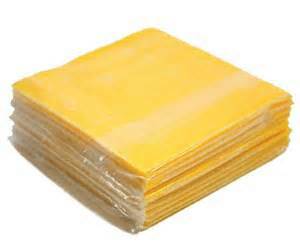 I gave this movie an American Cheese rating, simply because it doesn’t have as many memorable lines in it as others. Here’s the Theatrical Trailer for the movie. Sit back and enjoy. Join me next week when I venture into the realm of Fantasy with a movie which proves that true love will win out. “Scaling the Cliffs of Insanity, Battling Rodents of Unusual Size, Facing torture in the Pit of Despair. – True love has never been a snap.” The Princess Bride.